Despite her busy schedule, designer and founder of Pegeen Children's Formal Wear Marg Hyland took time to answer LoveToKnow's questions about popular flower girl dress designs, spring color trends, childrenswear for beach weddings, and more in this special interview. Pegeen works closely with brides and customers, offering a huge range of colors, low-cost customization options, and a range of sizes that extends far beyond what is typically available (like designer infant dresses and plus size flower girl gowns) - making it an incredible resource for flower girl dresses, junior bridesmaid gowns, and children's wedding and special occasion apparel. 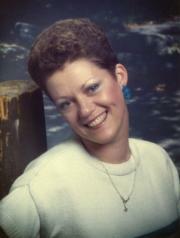 LoveToKnow (LTK): Marg, Pegeen has been in business for 25 years and served several hundred thousand satisfied brides. What inspired you to become a designer and to launch a business specializing in flower girl dresses and children's wedding apparel? Marg Hyland (MH): Shortly after starting Pegeen, I was planning for my own wedding in 1985 to my wonderful husband and partner. Of course, as a childrenswear designer, there was no other choice than to design spectacular outfits for my nieces. I was to be married in a restored 19th century historic church and village that I had dreamed about as a small girl called Waterloo Village in New Jersey. I wanted to incorporate some old and some blue and designed a blue silk plaid dress for my Flower Girl Dress and matching solid blue silk Ring Bearer knicker suit (I used a girl) with antique lace trim on both outfits. I brought it to the trade show and Richard Dreyfus bought the dress for his daughter. As luck would have it, he chose to have her wear it for an interview he did for Parade Magazine and it landed on the cover! Pegeen Formal Wear for Children was born! LTK: In general, what is the greatest stress brides face when trying to coordinate the wedding party apparel, and how do your services help alleviate that stress? MH: Because we own our own factory and control what we make here in the US (not produced in China like the majority of Bridal and dress manufacturers) we get easy customization and ship very quickly when needed. Also problematic for the bride is keeping all the loose ends together and this is exacerbated by the long distance usually involved with different party members. Pegeen offers a special kind of customer service - personalization and stress free internet planning. We first start by having them look at our Silk Fabrics page -- which is the core for deciding their theme and colors. Some brides need to match a particular designer and Pegeen has a cross-reference chart for their particular designer that is constantly grown through Bridal Participation where we have pages devoted to other Bridal Designers listed with their colors and our matching colors, with additional comments by brides. Sizing is usually a concern but after you have made 600,000 dresses you can believe we are really good at sizing. For girls who are overweight, Pegeen has a very special bodice fit program that ensures proper fit via long distance. We are so experienced in sizing that Pegeen guarantees the sizing! LTK: As a designer, you admit you love color, and many modern brides are thrilled to be able to coordinate the colors of their choice in the flower girl dresses. What color combinations are currently popular? MH: Pegeen Flower Girl Dresses and Ring Bearer Suits are all about color! I like to think of ourselves as "the alternative to boring white and ivory dresses". Besides offering the many colors that we do I have to say that my brides are truly responsible for a majority of the combinations seen on our Custom Flower Girl Dress page. Our hours are long in the day to accommodate busy schedules for our brides so we are available from 8am to Midnight (from February thru Labor Day) and 8am until 10pm so we can be involved in their color dilemmas. that are also keeping us busy this year. A recent combination of Mango and Sunflower landed us recognition in Martha Stewart Weddings. Increasingly popular is Apple Green with Chocolate and a color I call Citrus combined with Fire and followed by anything Raspberry. LTK: You advise brides to avoid floor length dresses for flower girls and choose designs that reflect both elegance and a child's spirit rather than mini-replicas of bridesmaids' gowns. What other advice you would give to brides in choosing flower girl dresses? MH: We help the bride choose a style that not only picks up part of her dress or the bridesmaids' and even have them send a link to us so we can see their proposed outfits. As a designer, I can suggest styles that may compliment by looking at their choices for the rest of the wedding and help tie it all together. Its not just choices of colors but including the same or similar fabrics like organza or tulle. LTK: You also have a wide range of colors and patterns for boys' apparel and ring bearer outfits, providing tremendous options rather than the tiny tux or dark suits commonly chosen for boys. 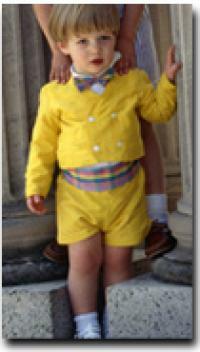 What are some of Pegeen's most popular colors and styles for ring bearers? MH: Boys, whether they are Ring Bearer or Page Boys from us are non-traditional alternatives to a boy in a tux (although we offer that too). Many times, because brides don't want to spend as much money on the boy, a bride will choose a separate vest to coordinate to an existing pair of khaki pants. But traditionally we combine the colors of the flowergirl with a safer "boy color" like a recent wedding of cranberry and oak. LTK: Beach weddings are proving to be very popular venues for contemporary ceremonies. 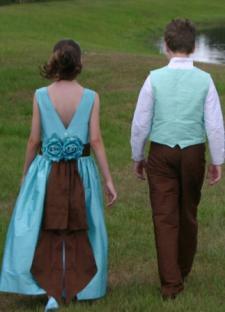 Can you suggest any specific children's formal wear designs that would work best as attire for beach or outdoor venues? MH: Lately we have begun designing outfits for beach weddings and destinations like Costa Rica. We ship our designs worldwide as well and feature our Real Weddings in places like Great Britain, Switzerland and Canada to beach weddings in Nantucket and Hilton Head! One of our favorite things to do is to add shells to our skirts and combine it with colors of sea glass. 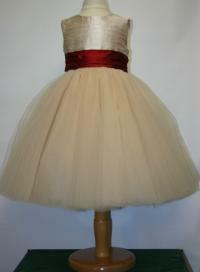 LTK: You've recently added a section on specialty couture flower girl dresses. In addition to this new development and continuing your commitment to the high level of quality and service you currently uphold, what plans do you have for the future of Pegeen? MH: This season, we are excited to add a special couture line of dresses that are inspired by customers. Like for instance, a very special flower girl dress designed for an artist in Midland TX was absolutely wonderful. The bride and her charming Southern mother worked with me to design a flower girl dress inspired by the series of Art Works entitled "Dance Class" by the renown Impressionist, Edgar Degas. We created a champagne silk dress with layers and layers of soft tulle and simple sashes in bright Monet colors inspired from his series of his gardens. Unique web-design features including a place for the bride to create and then have her little attendants walk down the aisle with us as we have been doing since 1982. An easy to use KIT that we just introduced that has a fantastic way for brides to mix and match their colors with a special cut out system like a Color Form playset. Our model of the year contest - we are sending one of our customers and a family of 4 to shoot a commercial and the weekend on Disney is on us! Please visit the Pegeen website or call 1-877-473-4336 for more information or to order from their incredible selection of formal wear for children. Live web chat is also available.